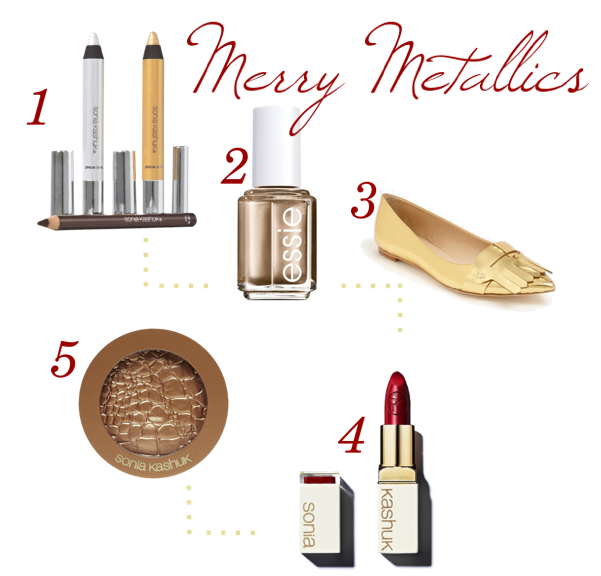 everything hauler: Metal Head- Playing with Metallics for the Holidays! Metal Head- Playing with Metallics for the Holidays! Sparkle and shine! Metallics are the new bling when it comes to beauty and accessorizing in a subtle yet statement making way. From nail color to jewelry, tossing in a bit of luster into your look can make all the difference from dull to gleaming! Tip for the trend- Try not to mix and match metals. If you are going for the gold, stay within the right color scheme such as yellow gold or rose gold. If it's silver, mixing finishes, such as brushed and polished, will add depth to your style. Finalize your look by adding a pop of color in the lip. I recommend a good red for the holidays like Sonia Kashuk's Limited Edition 'The Red Lip' in matte. Incorporate your beauty metallics with your accessories like these Kate Spade New York 'Galley' Flats in gold! Here are a few of my favorite mettalics for the holiday season!